It would have been GREAT to have filled this page with lovely photos of gorgeous cars, though there would be the problem of making the choice of which ones to use. Now that I have 500Megs of Webspace on www.oneandone.co.uk I have the opportunity to select a few car pics from friendly (?!?) sites for your delight. Click below to see my choice. I 'borrowed' these photos from elsewhere and sadly lost track of all the different places I got them. I want to thank all the people who published their photos for me to pinch. I am of course giving you a much bigger audience for your GREAT work (but no need to thank me!). If anyone is UPSET by my theft, sorry; if you are that protective then maybe you should keep your photos locked in a draw. I will write in more detail on the cars that I like, and why I like them, when I have more time. However, I will say a few words now. I like cars that LOOK GOOD. That simple statement though is very complex. "What looks good?" you ask. The Cord 812, most Bugattis, lots of coachbuilt bodies on Alfa Romeos, Bentleys, Daimlers, Packards, Duesenbergs, Isotta Fraschinis, Mercedes-Benz, Rolls-Royce, all these look good. But it is the post war years when mass production came to even these hallowed names, that car design really grows in importance. In the 1950s and 1960s you also get Alfas, Alpines, Aston Martins, Audis, Austins, Borgwards, Cadillacs, Chevrolets, Citroens, De Tomasos, Ferraris, Jaguars, Jensens, Lamborghinis, Maseratis, MGs, NSUs, Pontiacs, Peugeots, Porsches, Renaults, Studebakers, Triumphs, Volkswagens, Wolseleys, Wartburgs, and dozens more. I like the design of the original Ford Sierra, even whilst I dislike the car itself, and don't find it good looking. The original Sierra had a unity of design which is rare in modern cars and was a particular triumph for Ford - a company not really noted for good design. The best example of this was the Ford Sierra XR4 2door, a huge ungainly car with a distinctive 3 window side design. But Ford lost their nerve, and fiddled with the grille and lights, taking away both its purity and its originality. Having said that though, the Sierra was merely following in the tyre prints of the Citroen DS, but it took Ford more than 20years to get there. Compare the closeness of design of the Citroen DS Safari and Ford Sierra Estate. Ford had another go with original styling after it introduced the original Mondeo - a car that seems most likely to have had every panel designed by a different man. But it was remodelled to give it an oval grille, and this was the start of Ford's "new wave" styling. The Ford KA took that trend to extremes, and avoided my approval, but Ford carried with Escorts, Fiestas, the dreadful Puma, and that great whale of a car the Cougar coupe. In the midst of all this came the Focus, a truly original design for a family hatchback and not bad looking too. Thankfully, Ford got an ex VW employee to pen the Mondeo replacement; it may be a bland eurobox, but at least it has a simple elegance. So good car design is not only found on exotic or expensive cars. Even exotic cars can turn out real horrors. 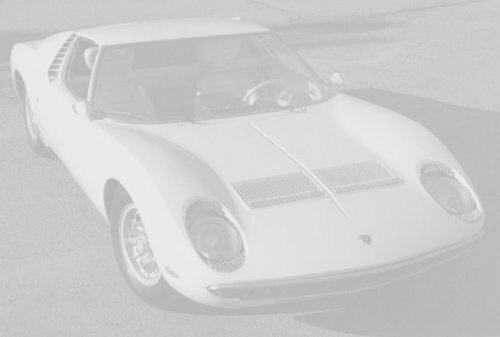 The absolutely stunning Lamborghini Miura rightly put the tractor company into the centre of the exotic car world, with its superbly proportioned and detailed Bertone body. When it came time to replace that car, Bertone were again asked to follow its delightful Espada and Urraco designs, and they entrusted the world to their rising young star Gandini. Enter the Lamborghini Countach; the name "Countach" actually means "WOW" and that really says it. Unfortunately the car carried on in production for far too long, and got overblown, overwinged and just downright gross. Its successor the Diablo was no great improvement, and Volkswagen's 2002 successor, the Murcielago, has plainly NOT learned any lessons. Oh I could go on for ever, but maybe I shouldn't. Look at my photos instead.